When was the last time you saw Marvel’s superhero movie? Was it yesterday, last week or even today? The key here is not to provide me a day or what movie you saw, but why? There’s a common mistake being made by everyone; we all rush to the local theaters to watch something outstanding, to stare at our favorite heroes and cheer for them. But the truth is, we don’t believe that heroes which appear on the silver screen exist in real life. But hey, it’s time to switch back from fantasy to life… Because there is an outspoken hero who exists. Much cooler than Wonder Woman or any team member of the famous Avengers. And her name is Paula Dafonat, a woman who made the heroes of documentary, Step, to go that far. Because one fine day, many moons later, when she will look back, she will see what she has done is much greater than many of us could have ever done. She is a true inspiration of what must be done every day to achieve such an outstanding result. And my gosh, what she has done! Set in Baltimore in Maryland’s school, most of the students but mainly Blessin, Tayla, Cori are going through a struggle on daily basis. They all want to graduate from school and enter Univerrsity. But even if they get enough money, the grade is what’s important to be accepted in the best school. By entering the Step class, they wish to become the first school in Maryland to win in the competition. And while they have a long journey to make, each and everyone will have a chance to learn about themselves more, what they want, to be disciplined, prioritize the needs of daily life, and why they want to improve on what they already have. 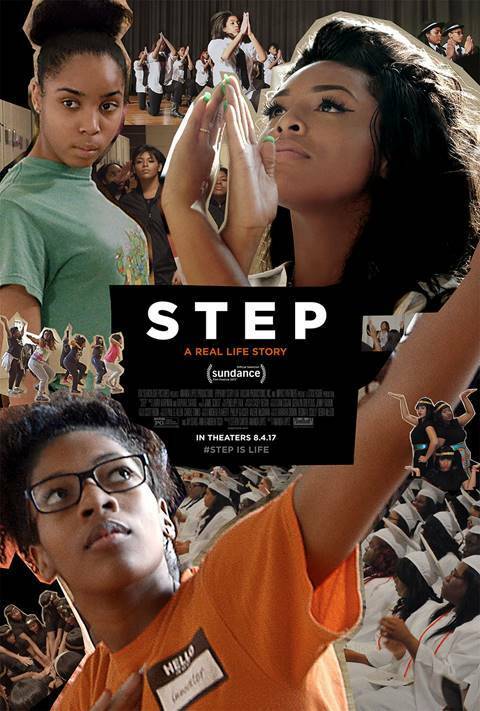 Step is a documentary that will make you experience everything first hand. It’s a powerfully told story which gives an authentic look of a true representation of society for all of us who are used to thinking as if it’s well developed. But it was not. And it is not. Cori, as a founder and coach of the group makes herself clear enough for the girls to take themselves seriously. As the film takes a gentle step and moves forward gradually, you will be amazed how wonderful they are. How tearful it is to see what a human being can do when there is support, when there is no judgement and only a complete understanding and blind trust which eventually will be paid off. To say Step is an important movie to watch is almost like repeating myself all over again. Saying how inspiring it is means I borrow the same praised words used by someone else. But the most fair one is when you find yourself speechless. When you define the level of magnitute of overwhelming feelings you experience. And when the heart tells you more than any word poasibly could. Yes, Step cannot be defined by words, but only by feelings you will have to rediscover for yourself once you see it.